Beautiful independent villa situated on the hills behind the Versilia coastline are, in a property extending for about 8000 sq. This charming villa, surrounded by ancient olive groves, is in peaceful location and offers extensive views over the Versilia coastline. The owner a famous interior designer, has recently restored this property and turned it into a charming private villa. The location is ideal to enjoy the tranquillity of the Tuscan landscape and at the same time to be in easy reach of Viareggio and Forte dei Marmi offering nice beaches, restaurants, night life and shopping facilities. Large, welcoming independent villa with private pool situated on the hills surrounding Arezzo. This property is in quiet and panoramic location and allows to spend a relaxing holiday in close contact with nature. The house is furnished in a rustic style and is surrounded by a big furnished garden with a private pool. This villa is on a 7-hectare estate which is partially farmed and partially cultivated with vineyards producing a nice wine (available to be purchased). The nice town of Arezzo (with railway station) is approx. 10 away and the village of Subbiano is in walking distance (approx. 900 m away). 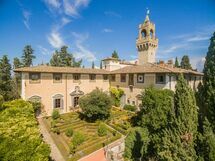 Beautiful villa with private pool situated on a large park at the foot of the hills of Cortona, a lovely town dating back to the Etruscan times. The villa dates back to the 16th century and offers comfortable interiors furnished with some antique pieces. The outside areas are very large and provide a nice park with a spacious solarium area (near the pool) and some charming corners shaded by century-old tress. The access to the villa is via an unpaved but well-maintained road.